IFA 2013 is just around the corner which means the yearly tech jostle by minor companies for headlines is in full force. This time it is Chinese company Umeox hoping to wow with the fact that its latest smartphone is set to be the "world's thinnest". 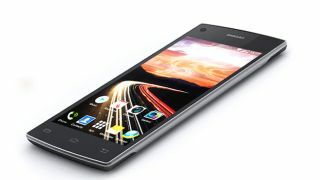 Originally rearing its head back in June, the Umeox X5 is a mere 5.6mm, 0.24mm thinner than its nearest rival the Huawei Ascend P6. This means that it is thinner than a pencil – so us tech scribblers will have to come up with a brand-new object to measure the phone with. Or we could just keep saying it's thinner than a pencil but that's not exactly scientific, is it? Given that IFA's halls are more spacious than Uwe Boll's film award cabinet, we expect there will be more companies clamoring for the world's thinnest crown. But, for the moment, the Umeox X5 is the slimmest Jim around with its rumoured 4-inch display, MediaTek chip and 5MP camera. Interestingly, when whispers first emerged about the device it had a 5.3-inch display but it seems that the smaller 4-inch variant is what will be unveiled in Berlin. The phone is set to be shown off at IFA 2013 under its European Thompson Mobile guise and will be running Android Jelly Bean. Want to know what else will be launched at IFA this year? Click here to magically find out.